Q: (Castmodean) Can we have an update to the Roadmap for the Foundry please? Dstahl: Season 6 includes an updated Dialog Editor, many new UI improvements including new Mission editing functionality. Lots of other minor quality of life improvements. As far as tagging, there will be new efforts to add content hookups from Season 5 to Season 6 along with tagging of the new Tholian enemy group. Also in the near term and possibly shortly after Season 6, we are working on the ability to Feature Foundry missions prominently within the Episode Journal. Longer term improvements to the Foundry that will come post Neverwinter launch include new enemy behavior settings, patrols, the interior editor, and the ability to prepopulate maps with prefab detail object layouts. Q: (Curii) The Andorian ship? When will we get it? Dstahl: You’re right! The Andorian ship did fall off the radar at some point. It is not on the schedule for Season 6, so when we do get back to making this ship it will be later on in the year. I’d expect the ship to be in the game sometime in the next year. Q: (atatassault) Any new info on upcoming STFs or alternative methods to getting the Mk 12 costumes? Dstahl: Season 6 is set to add several new group missions (some in space, some on the ground) designed specifically to be a challenge for Level 51 captains. One of those events includes a No Win Scenario challenge mode that rewards based on how long you can survive. In addition, we will be revamping the rewards structure for Season 6 as a part of our Fleet Advancement system, so look for alternative ways to get MK 12 gear as part of that update. Q: (Chevenix) Any thoughts on the STO exploration system? Any major revamp in the foreseeable future? Dstahl: I agree that this is one of the areas in the game that could use a revamp and we have a solid idea behind how we want to do it. That plan is dependent on changes being introduces with the Fleet Advancement system and Fleet ownership of Starbases. While I can’t put a definite date on when exploration will get the overhaul, it is part of the larger plan for expanding end game. Q: (CAPTWinters) Has any thought been given to having people controlled ships fighting against regular players for events? Dstahl: We’ve considered this and even attempted it at various times in the past, but due to how the game instances and limits the maximum number of players that can be in any given zone at a time, it is a cool feature that only a few people experience. Allowing players to play as alternate enemies in PVP is an interesting idea. We’ll consider that if we can find a way to work it into future events. Q: (Lord.horvaticus) Any update on when the Romulan faction will be playable? Dstahl: Not yet. So far there have been some top level discussions about it, but we are still a ways off to being able to introduce a new faction. However, allowing players to temporarily fly Romulan ships goes will with the idea in the previous question. Q: (Commadore_Bob) Are we going to get Borg Invasion type events for the other enemy factions? Dstahl: Yes. You will see the first of these new events with a non-Borg enemy faction when Season 6 launches. Q: (SkeeterUK) Why do you not like the KDF as it seems you Dan do not wish to flesh out the mission tree of the KDF. Dstahl: Considering that I’m one of the biggest proponents of KDF PVE, you may be referring to someone else. I’d recommend listening to the most recent Gates of Stovokor podcast where I go into great detail about this topic. Since launching as a PVP only faction, through a content strategy that benefited both factions we’ve been able to get the KDF faction an on-par with Fed experience from levels 18-51. There are only levels 1-17 to go and then the faction will have gone from zero PVE to a faction with content on par with the leveling experience or the Feds. So we are getting there slowly but surely. Q: (Hawks) When will we see new KDF Faction centered content? Dstahl: This is an easy one – the answer is: Today! There is a new Episode and 2 updated Fleet Actions that were updated for the KDF (Romulan Temple and Federation Minefield). Q: (Falcon_Night) Is a translation of the game going to be realized for the Spanish language? Dstahl: We have renewed efforts to localize Star Trek Online and now have a process in place moving forward to continue support of localized text updates. There are no immediate plans for a Spanish translation, but it is something that will be discussed as we look to expand STO into new global regions. Q: (Celtus) Will there be a possibility to upgrade OLDER ships with more slots for consoles or weapons to make them more useful for newer content? Dstahl: We have been riding the edge with CBS in regards with retrofit ships in the game. 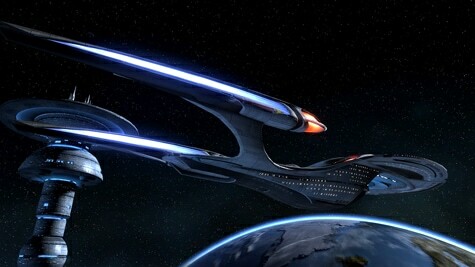 Since STO takes place 40 years past the events of the movie Nemesis, there is concern of having too many old ships battling it out with newer enemies. That said, we have talked about ways to customize older starships and consider a crafting-like retrofit system. That does not have buyoff yet and so we are on hold until we can work out all the details of how that would even work. Q: (Charlie25) Is there any plans to make an NX-01 bridge interior pack? Dstahl: Unfortunately, due to the timeframe of our game, unless we have some time travel missions to go back to this older ship, it is unlikely that we will be introducing a custom bridge interior for this ship. We are much more likely to introduce props and interior layout tools that would allow players to build their own ship interiors as part of the Foundry down the road. Q: (Kingdox) Beyond creating new accolades, will the accolade system get any updates in the near future? Dstahl: An update to the Accolade system and UI was on the previous to-do list that Stephen and I had put together. While it isn’t on the Season 6 schedule, we agree that this is one system that could use better presentation and more challenges/rewards eventually. Q: (SlothfulDragoon) Saucer Separation for the Galaxy Dreadnaught: Has it been cancelled or is it still coming? Dstahl: We hit a snag with this and had to postpone it for now until we can adjust some technical aspects of the FX so that it looks right. Once we get it working and it looks right on this ship, we can add it back to the release schedule. Q: (Griethiox) Space stations for fleets? More end game content? Dstahl: Both are the focus of the next big update – Season 6. Q: (Zoberraz) Are there plans to make the flagship auxiliary ships (Aquarius and HoH’SuS) standalone playable? Dstahl: That would be awesome. I expect this will happen at some point, but it is not on the current schedule. I think Al needs to put this idea on his whiteboard! Q: (Staran) Would it be easier to have FED/KDF peace and allow the KDF to use Fed mission content rather than spend years adding a mission or two here and there to the KDF faction? Dstahl: Maybe easier – but it wouldn’t make a lot of sense. There are better ways to get more KDF episodes like Alpha that released today and those episodes feel right for the KDF faction versus retreading FED missions. Q: (Blitzy) Do we have a rough ETA on the Vesta or other Rademaker ships? Dstahl: Both Al and myself have been in contact with Mark and we are going to work out a deal to get more of these ships in game. No solid ETA yet, but talks are in progress. Q: (soldieroffaith) Can we get a Sovereign Class Refit in line with the Odyssey class (Tactical/Operations/Science) designs? Dstahl: Al has some ideas around this and we are currently discussing how the new shipyard that will be an unlockable feature of Fleet Starbases might be involved in this sort of Refit opportunity. No guarantees that we’ll do it yet, but what you are asking for is in line with the type of ships we want to see coming out of Fleet Starbase Shipyards. Q: (RCO) Are there any plans to remove the uncertainty of Tech Drops in STFs? Q: (Historiphile) Cruisers and Sci ships don’t hold a candle to escorts in PvE, especially STFs. Will anything be done to address this? Dstahl: Well to be fair, the systems team is constantly evaluating powers and toughness levels (as witnessed by nonstop updates in weekly release notes) as game balance is an ongoing effort. As we look forward to new Level 51 content, great care is being given to ensure these missions are challenging for all classes, so yes we are continually working on it. Q: (gornman47) When do you think we could explore the Alpha side of the Federation? Dstahl: You are going to start seeing more content related to the Alpha quadrant this year as we begin to introduce new enemies to Star Trek Online such as the Tholians. Q: (Cmdr_Funke) I have built Star Trek models for twenty years. Will the Model errors be addressed concerning the scale of DS9 and its details, as well as various errors with other ships? Dstahl: As a video game, we have to balance gameplay and aesthetics with the published scales of ships and bases from the show. We’ve spent a huge amount of time playing with the scale of DS9 and at the end of the day, we like it where it currently is. As far as ship models, we have to balance our technology, rendering budgets, and manpower versus the time needed to be to the square inch accurate. At the end of the day, we strive to strike the right balance.